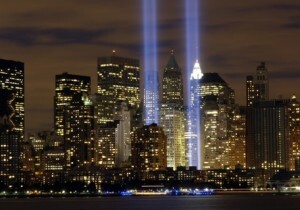 I knew that the 10th year anniversary would bring back memories and sadness over the senseless loss of so many lives. I did not expect it to affect me so strongly. I did not lose anyone, and I have no personal connection to the tragic event. Yet I started crying within moments of turning on the TV to watch the memorial. I remember driving my car on the way to work, stuck in traffic, when the news about the first plane crash was announced. I did not care about being late or anything at that point. I was just shocked. When I got into work no one was working. People were on the phones calling friends and family, checking emails, listening online or to radios. A few had access to TV’s. The news took over the day. I think we may have even been sent home early that day. It’s is all just a blur. No one got work done that day. The lady who worked beside me was hit the hardest in our area. Her husband was at a conference in the States with an insurance company. That company had their offices in the Twin Towers. Fortunately the conference was in another location. Unfortunately only the big wigs from the company were at the conference. They had an entire floor, above where the plane hit. My understanding is that everyone at work that day died. People her husband knew, worked with, talked with were just gone. It was hard on him, and her. They were on the phone a lot that day, even though it was long distance and she was at work. They were scared. He was stuck in the US, with people flying planes into buildings, who know what else was going to happen. Even though I live in Canada 9/11 changed my life. That day I called my long distance boyfriend and said let’s move in together. I was scared, and who knew what was going to happen. He moved from one end of Canada, BC, to Ontario within 10 days. We have been together ever since, and have two wonderful children. I don’t think that would have ever happened if 9/11 hadn’t. I always said I would never get married or have kids. 9/11 changed that for me. I think the hardest part of the 10th year anniversary of 9/11 was explaining it to my children. I cried as I told them about how police and rescue workers went into the buildings to rescue anyone they could, knowing they may not come back out. That took courage. I explained how many of the police and rescue workers died that day. It was hard for them to understand the whole thing. 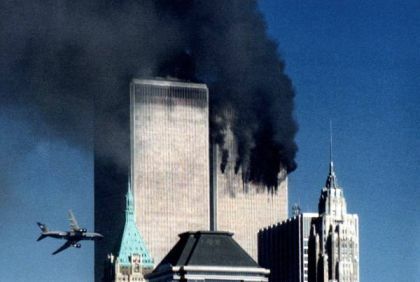 Why would someone fly a plane into a building? Why did they want to kill people? We had to turn the TV off and just have some family time. We did not turn it back on until the kids went to bed. The horrible images were just too much to put them through. One day they will be old enough to learn more about it, but not with Mommy crying as she tries to explain it. 9/11 is a life changer. I don’t want my kids to lose what innocents they have, the trust that all is good in the world and nothing bad is going to happen. That will happen soon enough as they got older. Even now I feel sad, and cry when I think of all the lives changed in a bad way that day ten years ago. I like remembering a couple of stories about that day, small simple miracles in a way. One person was running late but stopped for a coffee anyway. Another person called in sick. One person missed the bus/subway. These small things saved their lives. There are many stories like this, but not enough, not nearly enough. May the people who died that day, and later from the chemicals in the air, may they have peace! For the people who did this, may you wake up one day and understand that this was wrong! I tell my kids all the time, temper tantrums don’t get you what you want, no matter how big of one you throw. To me 9/11 was just another type of temper tantrum. Someone did not get their way so they did what they could to destroy lives. You know what, they still did not get their way!